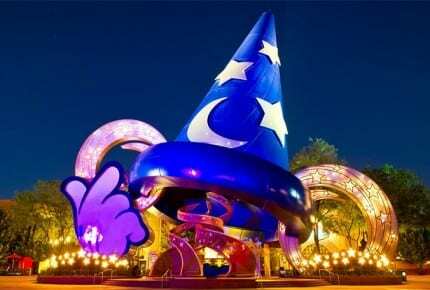 Now it appears to be time to say goodbye to a Walt Disney World icon: Sources tell News 13 the Sorcerer’s Hat will be removed from Disney’s Hollywood Studios in early 2015. According to our sources, as the theme park crowds thin after the New Year, the construction walls will rise. Those walls may be up in time for the Walt Disney World Marathon in late January, or shortly after the annual marathon weekend. The 122-foot-tall Sorcerer’s Hat has stood in the center of Disney’s Hollywood Studios since 2001, when it replaced the Earful Tower as the theme park’s official icon. Earlier in October, our partners at Orlando Attractions Magazinereported the possibility of the Sorcerer’s Hat being removed after noticing the hat’s absence from a map of Hollywood Studios inside an updated Disney World brochure at area hotels. Inspired by the pointed headwear Mickey Mouse dons in the “Sorcerer’s Apprentice” segment of the 1940 film “Fantasia,” the Sorcerer’s Hat debuted in 2001 at what was then known as Disney-MGM Studios to coincide with Disney World’s “100 Years of Magic,” celebrating the 100th anniversary of Walt Disney’s birth in 1901. Following the “100 Years of Magic” celebration, the Sorcerer’s Hat has served as a backdrop for shows and special events at Disney’s Hollywood Studios. Under the hat is a kiosk for selling and trading collectable Disney pins. The Sorcerer’s Hat was built right in front of the replica of Grauman’s Chinese Theatre that houses the Great Movie Ride, effectively hiding it from the view of guests entering the theme park. Some Disney fans have speculated the reason behind placing the Sorcerer’s Hat in front of the ride entrance was for legal reasons. Rumors allege the new owners of the real Chinese Theatre in Hollywood, which had changed hands in 2000, wanted a cut of any images Disney sold to guests showing the replica theatre in the background. Disney has never confirmed that story, but the replica theatre’s real-life inspiration, now known as the TCL Chinese Theatre, most recently changed ownership in 2011. The previous co-owners were Warner Bros. and Paramount. Attractions Magazine noted back in 2009, when Disney’s Hollywood Studios celebrated its 20th anniversary, Walt Disney Imagineer Bob Weis commented on an old photo of the park showing a view of the replica Chinese Theatre. Walt Disney World confirmed Friday another closure at Disney’s Hollywood Studios: The Legend of Captain Jack Sparrow walkthrough attraction is slated to close Nov. 6. The Legend of Captain Jack Sparrow opened in 2012 on Mickey Avenue in Hollywood Studios’ Animation Courtyard, replacing a similar walkthrough attraction, Journey into Narnia: Prince Caspian. This marks the third attraction at Disney’s Hollywood Studios to close in 2014, following the American Idol Experience in August and the Studio Backlot Tour, one of the theme park’s original attractions, in September. Along with the removal of the Sorcerer’s Hat in early 2015, it’s clear the landscape of Disney’s Hollywood Studios is undergoing big changes. Speculation as to what will replace the Studio Backlot Tour has ranged from a third track to the popular Toy Story Midway Mania, to an expanded Pixar Place with elements copied from Cars Land at Disney’s California Adventure, to the long-rumored “Star Wars Land” that has been talked about but never confirmed ever since Disney bought Lucasfilm in 2012. For now, all we can do is hold on to our hats as we wait and see.